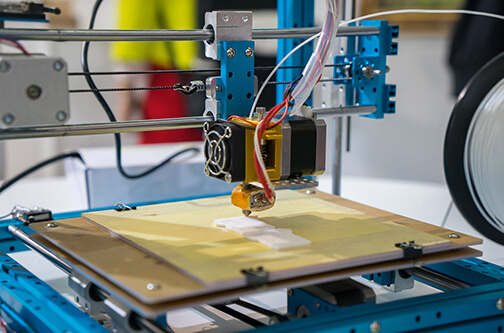 If you own a 3D printer you might have discovered that most of the CAD software for designing parts is either expensive or not easy to use. The eMachineShop CAD software might be your perfect solution! Why struggle with finicky shareware or expensive high-end software? eMachineShop CAD is suitable for designing gears, cams, enclosures, levers, brackets and countless other mechanical parts (2.5D shapes with up to 6 orthogonal views) but is not suited for complex curves such as those that occur in statues, faces, other biological shapes, etc. See our custom machined parts page and Facebook page for examples of the wide variety of parts than can be modeled. Create your design in the eMachineShop CAD software. File | Export to STL. Import the STL file into your 3D printer software. When one line shape is partly co-linear with another, try moving the smaller shape away from the other one by a small distance or using the Line | Contour feature to expand or contract the line a small amount and delete the original line. You might need to remove near edge chamfer (bevel) or round settings. When a contour has splines, if the splines are not considered closed, try using Line | Convert Splines To Arcs. When a contour has many small segments, try using Line | Simplify. Remove thread and bend lines. When the shape of a part is primarily a turned shape (like a chess pawn) but is not designed with the Revolve feature, try Tools | Convert To Revolve. When a contour has arc to arc connections, try adding a small straight segment between the arcs. For holes try Line | Machine | Far edge | Straight. If a chamfered edge is not exporting try rounding sharp corners in the 2D view. If you are not able to export, try to isolate the problem by making a copy of the design file; then remove some features; try the export again; and continue until you isolate the problem feature.